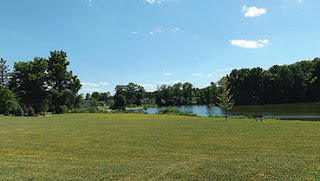 Medina County’s picturesque city of Brunswick is locally famous for its abundance of public parks. Indeed, the area is home to a grand total of 23 scenic parks that cover an impressive 335 acres of Ohio land. With so many parks to choose from, you may find yourself asking questions like: “How can I know which ones to visit? And do they have my preferred amenities like biking trails, picnic spots, or jungle gyms for my kids?” To help you pick your ideal park, we put together profiles of five wonderful green spaces in Brunswick. Home to the Susan Hambley Nature Center, this iconic 79-acre park borders Brunswick Lake where visitors are welcome to fish, canoe its tranquil waters, or watch for turtles, ducks, frogs and many species of fish. This green space hosts a bountiful array of flora and fauna, alongside a 1/2-mile nature trail through the towering trees. For a taste of 19th-century charm, visit Brunswick’s Heritage Farms. This historic 32-acre property boasts a farmstead museum from the 1860s, which showcases fun exhibits of local history, as well as a number of picnic spots and walking trails. The farm’s mile-long nature path cuts through the high grasses where feathered friends like pheasants and meadowlarks make their home. There’s also an on-site farmer’s market on the second and fourth Sundays of every month. The city’s oldest park, Neura Park is a community staple. Filled with jungle gyms, swing sets, and well-kept courts for tennis, basketball and sand volleyball, it’s a great place to take the kids for an afternoon of playing and picnicking. There are several grills and picnic tables set up for barbecue get-togethers as well. Brunswick’s bicycling enthusiasts agree that North Park is the place to be. Featuring two miles of bike trails through the park’s forested areas and a 1/3-mile paved track around its lake, this 65-acre green space is perfect for nature lovers. Wildlife watching, fishing and trekking are all popular pastimes here, and there’s even a play structure for children to enjoy. At a sprawling 30 acres, Rolling Hills offers something for everyone. Featuring a glorious showcase of long-standing trees and surrounding forest, this park hosts a walking path beside the lake for casual strolls, along with fishing from the pier, tennis and basketball courts, as well as picnic tables with grills for al fresco dining.